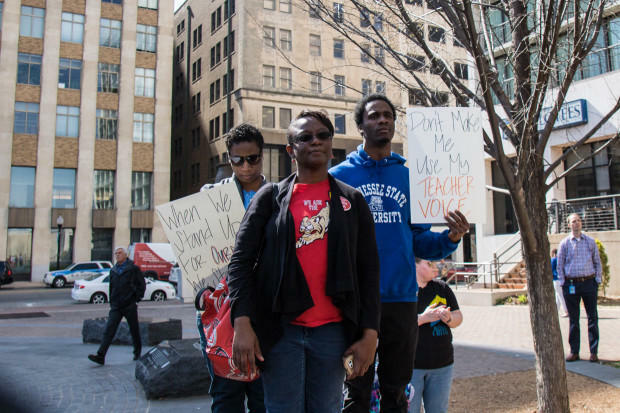 Teachers, parents and students at a March 2018 education rally in downtown Tulsa. After months of gridlock and failed deal-making, the Oklahoma House and Senate have passed a nearly $450 million tax package designed to fund raises for teachers and avoid statewide school closures. Gov. Mary Fallin said she’ll sign the tax package, which fell short of teachers’ demands. Educators still plan to march at the Capitol April 2 to pressure lawmakers to spend more on schools and public employees and continue a debate that has highlighted growing gaps and frustrations over taxes and government. This is the first time the Oklahoma Legislature has approved a tax increase in nearly three decades, and lawmakers marked the historic occasion by applauding themselves. One reason it’s taken this long is that anti-tax sentiment runs deep in Oklahoma, and education funding and tax policy have long intertwined. The public’s resistance to taxes intensified in 1990 — the last time teachers walked out of their classrooms over a lack of funding. Their movement prompted lawmakers to pass a $560 million education overhaul to reduce class sizes, boost salaries and increase school spending. The reforms were funded by tax increases, which many Oklahomans were not happy about. They retaliated by passing State Question 640, a Constitutional amendment requiring any tax increase get three-fourths support in the legislature. In the years that followed, lawmakers started signing national pledges against tax increases. The tax package House members passed includes an increase in oil and gas production taxes from 2 percent to 5 percent, a 3-cent increase to gasoline taxes, a 6-cent increase to diesel taxes, and a $1 tax on a pack of cigarettes. It also contained a $5-per-night hotel/motel tax, but the Senate repealed that part. During a late-night session on March 26 Cleveland debated against the package, and scolded fellow legislators for not trying to find money elsewhere first. Cleveland suggested other ways to raise revenue, including eliminating some tax exemptions given to corporations. Cleveland represents a large House district that stretches across four counties and includes the city of Purcell. With a population of about 6,000, Purcell has dubbed itself the “Heart of Oklahoma.” Republican Rep. Tim Downing, who also voted against the recent tax measures, represents the area as well. Neither he nor Cleveland responded to StateImpact’s interview requests, but the legislators’ staunch anti-tax positions during the education funding debate angered some of their constituents. The Purcell district has lost about 12 teachers due to budget cuts. For months, Midkiff has begged lawmakers for more financial support. The superintendent regularly asks parents to call and email their lawmakers, too. The House members didn’t change their stances, and Midkiff worries they’ll run unopposed this Fall. But John D. Montgomery, publisher of the Purcell Register, says state legislators could pay a political price for not backing tax increases to improve the state’s budget. “I talked to a couple of people in our town that are so upset with how it’s being done that they’re thinking about running,” he said. Montgomery is angry, too. He printed multiple opinion pieces criticizing the two lawmakers. He says he’s worried about more than just education, though. He thinks other state agencies need more funding as well. Montgomery says if that means raising taxes, then so be it. Of course, many people across the state — and in Purcell — don’t think raising taxes is the answer. At Rubys Inn and Restaurant on the south side of Purcell, a group of older men meet regularly to talk over coffee — and to pester the waitresses and anyone else who sits near them. One of the men, Bud Hardcastle, says the public has been taxed enough. All of Hardcastle’s friends at the table agreed: Lawmakers should find the money without raising taxes. But the teachers — some of them from 91 districts that have resorted to four-day school weeks to save money — that still plan to walk out of their classrooms on Monday say they’re not satisfied with the tax package lawmakers passed. They want more. The state’s largest teachers union has demanded a $10,000 pay raise over three years, $5,000 raises for school support staff and $75 million in restored funding for school’s operation budgets. They’re also fighting for raises for state employees, which are also planning walkouts. Adrian Anderson is a father of three kids in public school and worked with students in the Oklahoma City Public School district. He says he has no problem raising taxes to give teachers a raise. “I’m all for paying teachers an additional $5,000, $10,000 — give them $20,000,” he said. But he agrees with Bud Hardcastle on one thing: Anderson hopes the nearly $450 million tax package lawmakers agreed to send to schools actually improves conditions in Oklahoma’s classrooms — and all that tax money isn’t wasted.